I’m having a scarf issue. It is scarf weather, after all. Scarf and soup weather, so this makes sense. You’ll see. I swear. It’s no secret that I’m a huge scarf freak, but do I really need like 45 scarves? Of course not. Can I stop buying scarves? Not at all. It’s a problem because I want all the adorable scarves in all the adorable stores. Maybe it’s just because I’m #omgautumn and it’s also probably because I can’t wear real pants at the moment and I’m wondering just how much heels will be out of question come December and I have no idea what my body will do in a few weeks and scarves are always a sure bet. No matter what, I can always wear a scarf. I’ve used scarves as blankets and pillows and umbrellas and the other day I accidentally used a scarf as a kitchen towel. There really is an issue when you’re mistaking your scarves for kitchen towels. I’m also having a grilled cheese issue, which I’ve alluded to multiple times in the last three weeks now. UGHHHH. Why must I love grilled cheese so much? Too good. And why must I love soft plaid blankets and shiny shimmery fabrics around my upper body so much? So listen. I realize that I made a tomato soup before. It is pretty delicious and has mascarpone and havarti stirred in. But this? This… is better. Maybe it’s just my weird pregnancy taste buds. But I declare this one BETTER. It may not be fair to say that: this version is slightly thinner. It’s creamier. Like from actual cream. It’s made with fire roasted tomatoes and dried basil, which I discovered after researching Nordstrom cafe’s tomato soup recipe. I caramelized the shallots a bit first AND added brown sugar into the soup to make it a bit sweeter. All in all, I’m freaking hooked. I have eaten it every single day this week. Actually, yesterday, I almost had a heart attack when I looked down at my plate and realized I was eating four grilled cheeses sandwiches. Then I came to my senses and remembered that I technically made TWO grilled cheese sandwiches (because one is never enough) and sliced them in half, therefore making it look like four. For the first time in almost nine months, I have an insaaaaaane appetite that is not going away. It’s intense. Therefore, I’m losing my mind over the soup. Oh oh oh! And the best part is: this is a small batch soup. Meaning I made it in a rather medium-sized saucepan and so can you! Sweet. Should I be embarrassed that below I tell you how to make a grilled cheese? Probably. I mean, I’ve told you how to make many a grilled cheese over the years but this like… a legit PLAIN grilled cheese. Well. Not totally plain. It looks plain, and it is rather plain considering I didn’t trash it up as I usually do, but it IS spread with brown butter before toasting and filled with three cheeses: fontina, gruyere and parmiagiano-reggiano. Can we call THAT the holy trinity? I think so. The sticks and the shooters? They’re just for fun. Of course, they are super fun in general, for a party (large or small) or for kids (I can imagine at least?) or for yourself for lunch, because that’s totally what I did. But that’s what it’s for: fun. 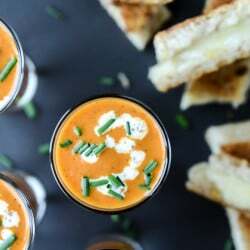 Make the soup and serve it however you’d like, cut the grilled cheese sandwiches into hearts or cows or triangles (are you boring?) or whatever you’d like. The key is smashing all the flavor together and dipping it alllllll together. Perfect pre-trick or treat sustenance? I think so. Heat a medium saucepan over medium-low heat and add the butter. Add in the shallots and garlic, cooking until soft and slightly golden and stirring occasionally, about 8 to 10 minutes. Stir in the tomato paste and cook for another 5 minutes. Add in the tomatoes, sherry, chicken stock, brown sugar, basil, salt and pepper, then bring the mixture to a boil. Reduce to a simmer and cook for 20 minutes. Transfer the soup to a high-powered blender and carefully blend until pureed. Transfer back to the pot over low heat. Right before serving, stir in the heavy cream. Taste and season additionally with salt and pepper if needed – it might, depending on your tomatoes. 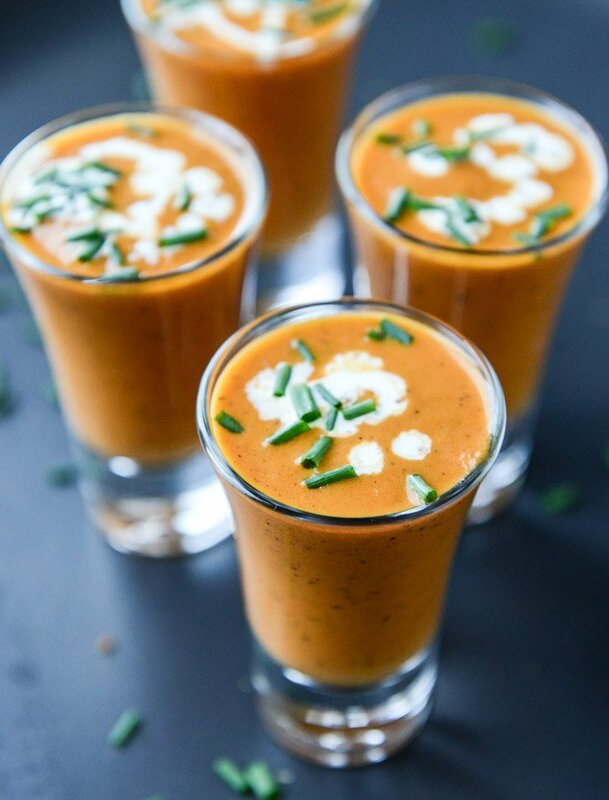 To serve, drizzle the soup with the extra cream and garnish with chives. Spread the outsides of the bread with the softened butter. Heat a large griddle or skillet over medium-low heat. Toss the fontina and gruyere and parm together, then fill the sandwiches with the cheese, topping the bread with a slice buttered-side up. Cook the sandwiches until golden on both sides, about 5 to 6 minutes per side, and the cheese is melted. Let them cool slightly, then slice into “sticks” with a serrated knife. 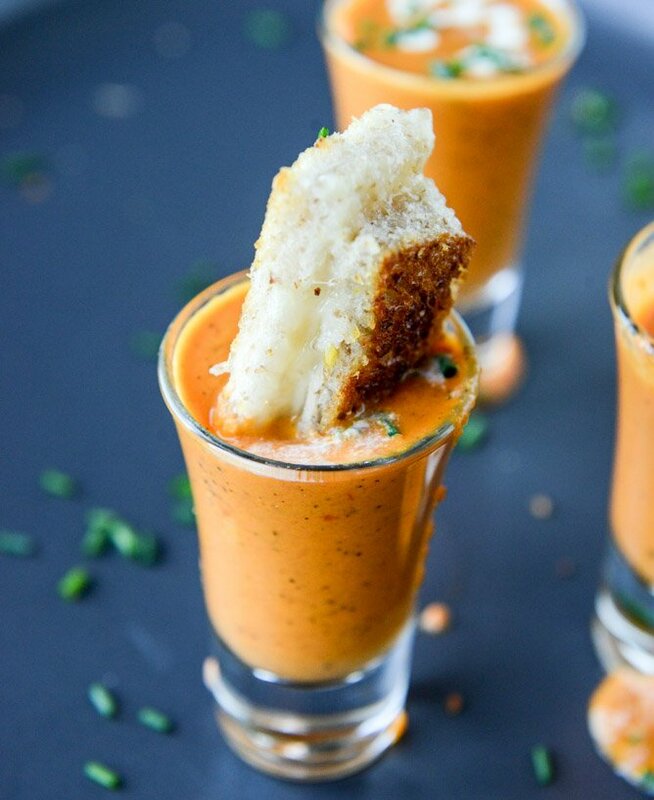 Serve with the soup shooters. maybe I can figure out how to wear a grilled cheese scarf. I’m currently pregnant and my consistent go-to snack/meal throughout the last several months has been grilled cheese! Not sure how I would have survived the first trimester without them! I would make it without the cream, for a healthier option:) But love it. breadsticks are always good and how could I resist making them with these pics! This is my favourite, favourite, favourite (I’m Canadian, hence the “u”) tomato soup recipe EVER. It is scrumptious! Definitely getting written down in the books for future use. I’ve made it a bunch of times now and it tastes better ever time, plus it’s super simple to make. Thanks Jess! Very tasty dish. My husband tells me to prepare at least once a week. HI. I’m planning to make these for New Years. Does this recipe make 4 to 6 “shooter-size” servings or “regular-size” servings? I’m planning on doing shooters and wondering if I need to double the recipe to make 10? 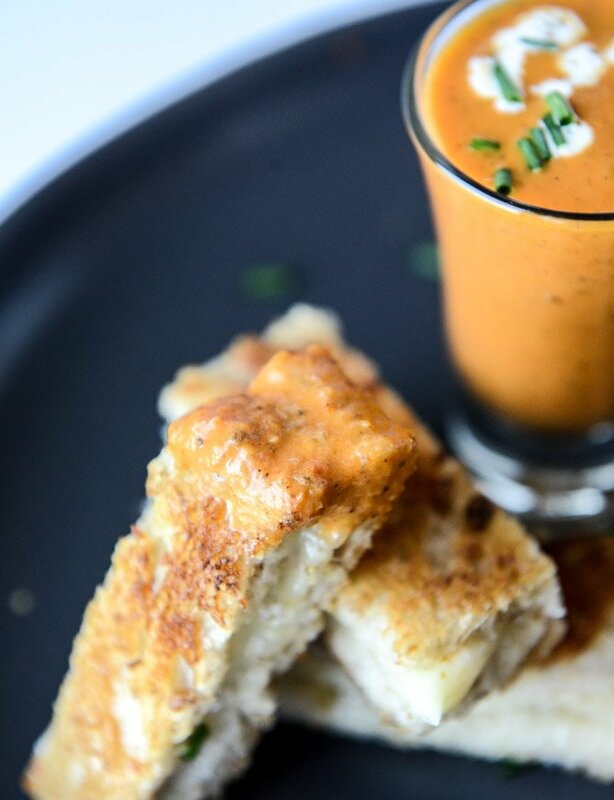 Just made the creamy tomato soup, with the grilled cheese, so delicious. Thank You, I’m so looking forward to trying more of your recipes! Pingback: New Years Eve Appetizers Ideas | Simple. Tasty. Good. I AM GOING TO TRY THIS RECIPE FOR CONSIDERATION FOR AN UPCOMING APPETIZER PARTY…WHAT WINE WOULD YOU CONSIDER PAIRING WITH THIS SOUP RECIPE?